Bamberka restaurant located in the heart of the Old Market Square in Poznań since 1972. It prides itself primarily on regional dishes from Polish cheeses, cold meats, wonderful goose, duck, St. Martin’s croissants, to Polish liquors: beers, spirits, tinctures. In the Bamberka restaurant, we bake cakes ourselves, we are making yeast dumplings. We attach great importance to natural ingredients, we do not use semi-finished products. We have a wide range of regional beers. In the Bamberka restaurant in Poznań, you can also try Benedictine, famous all over Poland, produced near Poznań in the Benedictine abbey in Lubiń. Benedyktynka Lubińska (Gall’s Anonim and From Seven Sorrows) is based on the same carefully selected and tested composition of 21 medicinal herbs. It gives the drink not only a unique taste and aroma, but above all perfectly affects the entire digestive system. Benedyktynka affects the digestive processes (especially with ample, festive meals), removes the accompanying various unpleasant ailments and brings quick relief after a hearty meal. The herbs contained in Benedictine also work in general strengthening, warming and calming. In Bamberka you can buy the famous candy fudge. The first fudges were produced in Poznań, the “father” of these sweets is called Feliks Pomorski, who learned how to produce them during childhood with his uncle in Zhytomyr. He developed these skills on an industrial scale in Poznań, where in the years 1921-1929 he ran a confectionery factory with headquarters at ul. Strzelecka 9 and Szewska 9, and in the 1930s at ul. Kanałowa 9. Candies were wrapped in paper with a cow’s drawing, which contributed to the quick popularization of the name. After the deportation by the Germans during the occupation, Feliks Pomorski founded a fudge production plant in Milanówek near Warsaw, which exists to this day. The first building, in which there was a scale for compulsory weighing of goods intended for the urban market, was erected in Poznań in the second half of the 13th century. Rebuilt in 1532-1534, it was expanded thirty years later by Jan Baptysta Quadro. The elements of the Renaissance design located today in the Poznań Town Hall: the fireplace decorated with the coat of arms of the city and lintels of windows with Latin sayings testify to the importance of the building, performing periodically as the seat of the municipal authorities. Craftsmen also took lessons in fencing here, and during the flood, services were transferred from the Poznań parish church. In 1890, the historic building was demolished, and in its place a neo-renaissance New Town Hall stood. After the war, based on existing iconographic messages, the weight was reconstructed. At that time, bread jacks, once adjoining to the east, were reconstructed. In the first half of the 16th century, a group of tenement houses was established in Poznań, the so-called building houses, erected by individual owners of individual plots. In the seventeenth century, a bread arsenal was built on the site of the mess, and the slaughterhouse was moved to Poznan scales. At the end of the 18th century, there were lifted uprisings. These buildings were repeatedly destroyed, rebuilt and rebuilt in their main framework (with the exception of the Poznań arsenal and cloth hall) rebuilt after the destruction in 1945. A small monument-hole in the Old Market Square, depicting a woman in a folk Bamberg outfit, standing at the back of the Poznań City Hall, recalls the role of German settlers from Bamberg, whose first group came to Poznan in 1719. The creators of this monument in the early twentieth century, decided to celebrate this event. There is probably no monument in Poznań that would be more wandering around the city than Bamberka. The Golden Leaders, who deal in the wine trade, were the main donors of the Bamberka monument. Goldenring decided to allocate 12 thousand brands for the construction of an object. The magistrate decided to put a manhole on the Old Market Square, which would be used by people and horses. Just before the outbreak of World War I, it was decided that the well would be crowned with the statue of Bamberka. The model was used by a long-time employee of the Goldenring company – Jadwiga Gadziemska. 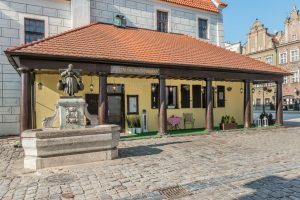 Bamberka has been on the Old Market Square in Poznań since 1977, at the back of the Town Hall next to the Bamberka’s restaurant. In 1973, the monument was entered into the register of monuments.